"I am going into the convent"
I remember so well the time when I clearly said these words. Those were the days when I could only think about getting married. Being healthy and young, I was very happy with my boy-friend, mountain climbing, skiing and enjoying concerts, and we were sharing as much as possible. However, I was moved by a mysterious power which made me refuse the marriage, and I chose the religious life. Now that 40 years have passed, looking back at the way I walked, I realize that this has been God's wonderful plan, and that I could not do by myself. Around that time, I was living near Azabu, near the convent, and I often attended Mass over there. 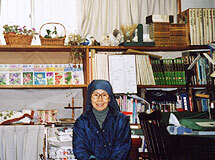 I went to ceremonies where young Sisters received their costume, and I even went to retreats for vocation. But I used to think that it was a different way of life, and never thought about it seriously. I was not very serious in the beginning, and during retreat sermon, I was drawing the face of a blue-eyed priest with curled hair (he was an Italian). However, after a few times, I was beginning to realize that Sisters were not only thinking of their own happiness, but of many other people, and also to live spreading prayers and the holy word of God. Maybe me too ? ... no, not for myself. I started to think about my life and I was troubled. I even ran away trying not to think about it, and that made me suffer for many days. The decision had been made, and after I said " I am going into the convent", I felt relaxed and stronger. From that time, until my entrance to the religious life, there were many opposition and difficulties. I think it is miraculous that I could get over many difficulties, and that I could live this worthwhile life until this day. I keep hoping that my life will be for the glory of God and that my presence can make many people happier.